For some time, I've been using a spreadsheet I made to figure out if my polar alignment is good enough to prevent field rotation. This was done as a part of the effort to beat flexure. At the time, I didn't fully realize how much of the seen drift was due to field rotation vs differential flexure. A few years ago, I put together this spreadsheet based on the math in Hook's paper. I've since found other references to the technique. There may be other resources on the web, too. These two are the ones that I felt were critical to the development of the spreadsheet. I finally made this spreadsheet as it appears now. Note how the data entry part below (exposure duration, declination, imaging scales) are listed below and the "What do I need?" values are listed at the top. This is more indicative of the way I made the spreadsheet with moving cells around rather than how it would work in the field. At the time, I was using PHD 1 to help polar align. I would watch the drift of the target star as it moved in dec over a 1 minute period of time. 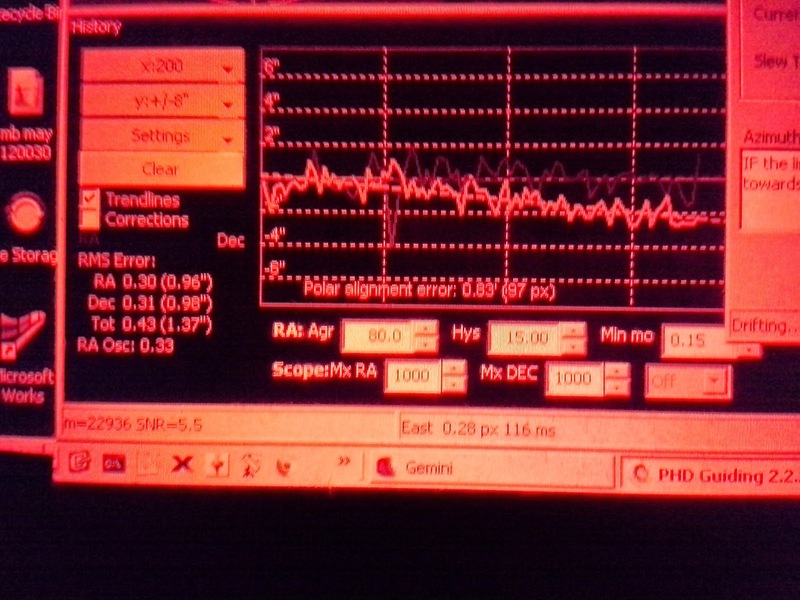 The estimates of pixel based drift was because the graph display of PHD showed increments of 1 pixel. Thus, it was important to show values of drift with this measurement. With PHD2, things are a bit different. 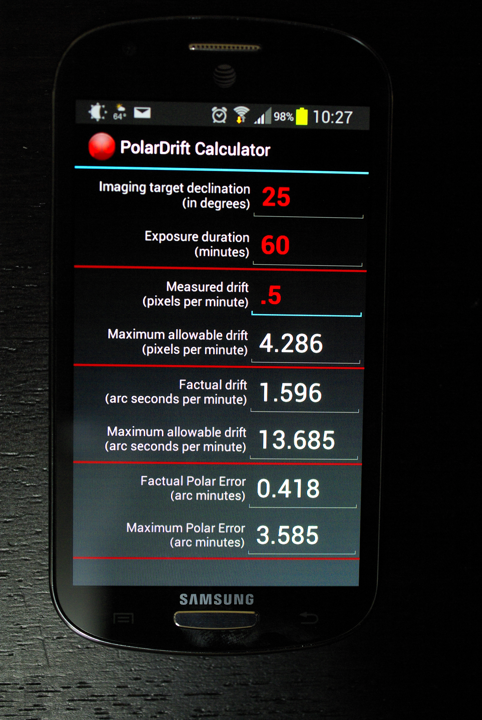 Now the drift alignment tool shows polar alignment error in decimal arc minutes. This corresponds to the first line on the "What do I need?" value. Thinking back to the recent exercises in the field, one of the PHD2 screenshots shows how the drift tool can give error information useful for comparison to the spreadsheet. Recently, there was some discussion among the TACos on email regarding the use of some Android apps. I made some comments about magnetic north and eventually the thread died out. I contacted one of the participants off the list regarding possibly converting the spreadsheet into an Android app. Alex Kukanin has been developing Android apps for a while and was willing to try it out. Quick collaboration over email and within two weeks it's nearly ready to go on the Play store. I'll update this post when it's available.